Saturday's anti-gun violence protest begins at Madison Park Technical Vocational High School and ends with a rally on Boston Common. By Hayley Glatter·	 3/22/2018, 11:19 a.m.
Update: Tens of thousands made their way to Boston Common to take part in the March for Our Lives, joining in a nationwide day of protest. Since the February 14 shooting that left 17 people dead at Marjory Stoneman Douglas High School, Massachusetts gun-control advocates have lobbied for reform, called for divestment from firearm manufacturers, and engaged with those who experienced the violence first-hand. And on Saturday, they will march. Thousands of people are expected to join the Boston March for Our Lives this weekend in conjunction with advocates from across the country hoping to put a stop to gun violence. 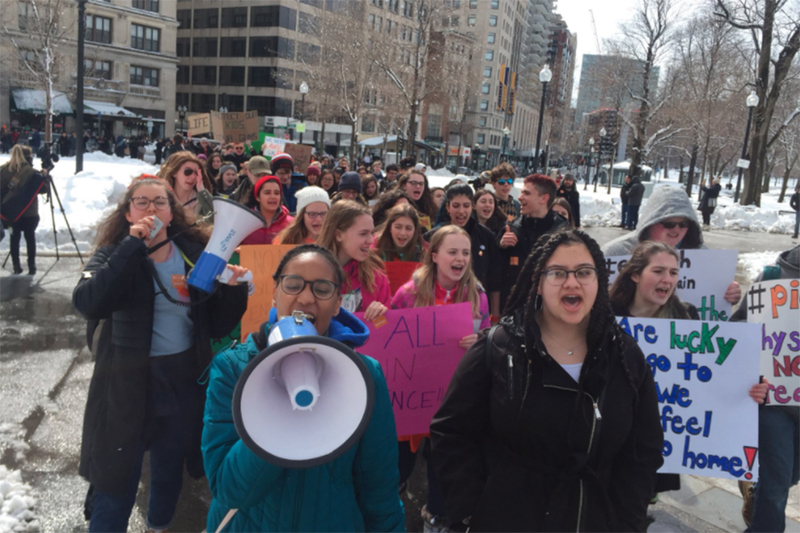 The student-led Boston march begins at 11 a.m. at Madison Park Technical Vocational High School and ends with a 2 p.m. rally on Boston Common. The gun-control debate has been reignited by young activists in the wake of the Parkland shooting, and the students leading the charge in Boston said in a statement that their generation will not stop its calls for reform. But the march is more than a show of unity; the organizers have policy goals, too. Massachusetts has some of the strictest gun laws and lowest rates of gun violence in the country, and the March for Our Lives leaders want even tighter legislation. According to the march’s website, the local advocates support updating the law that bans assault weapons in Massachusetts and instituting a red flag law in the state. Red flag laws allow judges to enable law enforcement officers to temporarily seize the guns of individuals who show signs of endangering themselves or others. The Boston rally is one of more than 800 such events around the world planned for Saturday, and 500,000 people are expected to show up to the flagship march in Washington, D.C. The March for Our Lives follows last week’s National School Walkout, in which tens of thousands students stood up from their desks and left class to honor the Parkland victims and demand gun reform.